Check back often to get the inside scoop on the happenings at Lambs Farm! “I just feel very proud,” Laura said as tears gently streamed down her face after sharing her accomplishments since becoming a Lambs Farm Participant in 1980. In the time Laura has called Lambs Farm home, she has grown in all aspects of her life. She loves competing in Special Olympic sports, donating to those in need and being a caring friend. Laura feels appreciated, supported and happy at Lambs Farm, especially at work. She is a dedicated Magnolia Café & Bakery employee and believes the responsibilities she holds at the restaurant help her develop a wide range of life skills and independence. Laura using the POS system. Laura cleans tables, hosts, keeps the restrooms spotless and is part of the Lambs Express delivery team. And recently, a new duty was added to Laura’s tasks. She is in the process of learning the new Point of Sale (POS) system, and she’s the first Participant to take on the role. Laura is currently in the training process and is catching on quickly. She knows how to sign in, collect money, handle credit cards and give change back to customers. Her next goal is to learn how to take and put orders into the system. After she masters the POS system, Laura wants to keep developing new skills. She looks forward to learning how to use the grill in the future. Lambs Farm is devoted to providing the best resources and opportunities possible to Participants in all areas of life. The Wellness Department carries out Lambs Farm’s mission by promoting healthy lifestyles with a variety of activities. While Participants have many choices, it seems as if the team camaraderie, competition and opportunity to grow has helped many decide on being Special Olympic athletes. More than 100 Participants train for 10 Special Olympic sports, which makes Lambs Farm one of the largest participating agencies in northwest Illinois. This year, Lambs Farm was recognized by Special Olympics, and the Wellness Department received a Hero Award at the 8th Annual Special Olympics Illinois Hero Awards banquet. This honor acknowledges Lambs Farm’s exemplary commitment to strengthen communities and its dedication to improving the quality of life for Special Olympic athletes. Lambs Farm hosts the Area Snowshoe event each year in January, providing the facility space, equipment and support for a great event. They recently started hosting a Motor Activity Training Program for athletes who have phased out of traditional sports. All staff members in the Wellness Department play a critical role in events, but one person acts as the glue who keeps everything together. That person is Special Olympic Athletic Director, Ginny Luptak. Ginny has been in her position at Lambs Farm since 2007 but has worked in the Special Olympic field since 2002. She interned at the Chicago Park District, where Special Olympics originated, and worked with numerous Special Rec Associations. Ginny uses her expertise to provide a fulfilling experience to Lambs Farm athletes. She feels a strong bond with them. Ginny coordinates anything and everything that has to do with Special Olympics. She helps complete every Participant’s physical and application for them to compete, handles all timing, entries, flyers and stats. She schedules games, organizes event logistics and does data entry. Ginny is a certified coach for five sports and is on the road to more certifications. Lambs Farm staff look forward to working with Special Olympics for years to come. Ginny is currently on the list to coach the Special Olympics USA/World Games in 2021 and 2022 and is eager to find out more details. We realize it can be a challenge to balance the sweet temptations and healthy choices. But don’t worry, our new lineup of FIT meals makes it easy, as each dish provides you with essential nutrients and healthful ingredients that are packed with flavor and served with a side of fresh fruit. The best part – they’re all under 500 calories! Each FIT meal is $5.99. They are offered Monday through Friday on a two-week rotation. Customers are able to receive a free punch card, and once nine FIT meals are purchased, the tenth is free! Stop by to enjoy of one these healthy, delicious and nutritious meals. Our wide range of ingredients ensure that their will be something for everyone’s taste buds. After 15 years, a special club formed by a common interest and fate continues to offer Lambs Farm Participants the opportunity to grow, experience fulfillment and create special memories. Jeanne Curtin, the admirable volunteer and club coordinator, can hardly believe its been well over a decade since her Elvis lunchbox grabbed the attention of Participants at Jewel and paved the way to the establishment of Lambs Farm’s Elvis Club.“It all just seemed to come together, everything fell into place,” Jeanne said. After hundreds of meetings filled with movies, peanut butter and banana sandwiches and everything Elvis, as well as two trips to Memphis and Graceland, Jeanne planned a one-of-a-kind celebration for the club’s special anniversary. On November 1, staff and Participants were invited to see Elvis tribute artist Travis Morris put on a live show. The gym was packed with excitement and anticipation. As soon as the hit song “Hound Dog” blared from the speakers, the basketball court was instantly converted into a dance floor. As the songs kept playing, it was clear that nobody wanted the show to end. Club members and Elvis got lost in the music, and the show was extended by a half hour. It’s safe to say the celebration was a huge hit. Employees at Lambs Farm manage a variety of tasks in preparation for the holiday season. As event planning takes off and catalog orders pile in, busy is one way to describe the environment in the winter months. Lambs Farm relies on the importance of teamwork through the eventful days to ensure customers receive the best experience and top-notch products. Earlier this week, five Participants worked together to assemble more than 120 candles for the new and refreshing Vanilla Spa Day basket in our Holiday Catalog. The aromatic vanilla scented candles will also be showcased at the 37th Annual Lambs Farm Holiday Lights & Craft Fair. The Participants started the process by inserting the wick directly into the middle of the jar and placing a stick through the center for it to stay in place. After the wax was safely poured and began to dry, the Participants next task was to make sure the wicks rested entirely in the center, which is crucial for the candles presentation. The jars were then wiped off to look immaculate, and a label sticker on the bottom gave the candles a finished look. Some Participants have been through the candle-making process before, but for others, it was an exciting opportunity to try something new. Lambs Farm is dedicated to providing productive employment to contribute to the community, and these opportunities exemplify how our organization operates in a manner that helps people grow. All of the Participants were in agreement that working together to complete an extensive task was fun and a great accomplishment. In a matter of three hours, they managed to make all the candles, clean up and pose proudly next to their finished product. You can get a head start on your holiday shopping and support the men and women of Lambs Farm today. “I could maybe take over her job,” Tom, a Participant at Lambs Farm, says with a smile. He is referring to Elaine Bock, the manager of Magnolia Café & Bakery, as he goes through his list of tasks he has mastered while working at the restaurant. Lambs Farm offers an abundance of meaningful work experiences on the Farm and in the community for Participants to obtain productive life skills. Tom’s interests made Magnolia Café & Bakery the perfect fit. And for the last 22 years, Tom has been a proud employee. From cleaning tables and answering phones, to hosting and setting up banquets, Lambs Farm has given Tom the opportunity to grow, learn and persevere. With Tom’s experience in various areas of the restaurant, managers were running out of new jobs to teach him. Tom handling meet on the grill. But there was one job. A job no Participant has had throughout the 56 years of Lambs Farm. On September 12, Tom became the first Participant in history to cook on the line. Tom’s dedication, passion and confidence at Magnolia Café and Bakery made him the perfect candidate. As he prepared his first hamburger from start to finish, Tom beamed with excitement and became committed to the learning process. He has already whipped up Reuben sandwiches, made fries and familiarized himself with checking temperatures. Staff have reacted to Tom’s new role in typical Lambs Farm fashion. Encouragement and enthusiasm spread through the restaurant when Tom stood in front of the grill for first time. 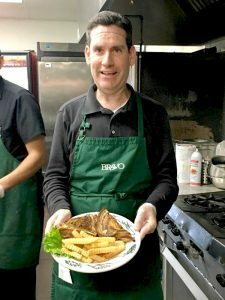 Tom is being trained by various cooks, and they are thrilled to guide Tom through the process and help him achieve his goals. He knows that he has support from all staff. Tom’s determination can potentially open doors for others. Participants have already shown interest in following in his footsteps as a cook. “People need to be inspired and Tom does that very well,” Elaine said. Isaac, one of the cooks, trains Tom while he preps the meal. Tom and his finished product. Guests gathered for unlimited family fun all weekend long, soaking in both rain and sunshine, to support the meaningful mission of Lambs Farm. What was traditionally Lambs Farm’s Community Tent Sale was transformed into Fall on the Farm, a brand new event which offered an abundance of fall activities to celebrate the season. Pumpkins were beautifully painted, sand art colors glistened in bottles, fall themed games were played and Farmyard animals had countless visitors. But the fun didn’t stop there. Smiles lit up the Farm as guests experienced a barrel train ride provided by the Lake County Farm Heritage Association and a viewing of vintage tractors. Steve Belliveau amazed families with his balloon twisting talents and supplied guests with another souvenir to take home. Those who visited solely for the Tent Sale had free access to an assortment of entertainment while shopping. WTTW’s BIG IDEA Traveling Lab allowed children to engage in themes such as emotions, life cycles, recycling and the natural world using the wonder, watch and learn more recipe. Lambs Farm’s Participants offered guests entertainment under the Pavilion in conjunction with the DJ on Saturday. The Aladdin cast reenacted scenes from their recent and successful production. On Sunday, there was a special appearance from An Exceptional Chorus, who sang beautifully for the crowd. The Tent Sale vendors gave guests a diverse and enjoyable shopping experience. From animal rescue shelters and boutiques to antiques and bath products, there was something for everyone’s interests. Vendors had success and created friendships as they helped one another through windy conditions on Saturday. The perfect weather on Sunday made set up and take down a breeze. The Lambs Farm Cedar Chest Thrift Shop displayed a copious amount of treasures in their tent, including seasonal décor, clothes, furniture and more. The Thrift Shop also maintained regular business hours, which served as the perfect place to shop on Saturday when the clouds came through and gave guests the opportunity to explore other unique items. Lake Bluff Brewing Co. (Lake Bluff), Fine’s (Libertyville), Mario’s Cart (Carol Stream), Rosati’s Pizza (Libertyville) and Tighthead Brewery (Mundelein) were the outstanding food and beer vendors who participated in the event. Their great customer service, along with delicious food and beer were a great addition, as they offered families quick options in midst of all the Fall on the Farm happenings. Guests could also go to the Magnolia Café & Bakery for a sit-down lunch and visit other Lambs Farm businesses throughout the day. Special Events Coordinator, Kathy McMeins, spent months organizing and planning Fall on the Farm. Her vision was able to come to life, and she is grateful to everyone who participated. “I would like to thank all the tent sale vendors, food vendors, beer vendors for their donations, WTTW, an Exceptional Chorus and the Lake County Farm Heritage for coming out,” she said. Volunteers introduced games to guests, assisted in crafts, organized the tent sale items and helped with clean up. “The volunteers really do make it all happen,” Kathy added. The wonderful moments captured below solidify that Fall on the Farm was a success after its first year. Lambs Farm would like to thank everyone who was involved in the event and for your support in helping people with developmental disabilities lead productive, happy lives and connecting with the human spirit in us all. Click here to view more Fall on the Farm photos! Congratulations Aladdin Cast and Crew! Lambs Farm Musical Theater did not disappoint! After months of hard work and hours of practice, Participants took the stage and put on a fantastic show. From the creativity in set design, to stunning costumes, the crowd enjoyed the wonderful entertainment from start to finish. They beautifully presented the important message that that you should always be yourself and and remember where you came from. Co-directors Janine Neumann and Paige Rodriguez said they are incredibly proud of the cast this year. Many Participants memorized their lines, which shows a lot of dedication. A new idea was executed this year, which was to get the audience more involved. This resulted in a fresh and fun experience for everyone as the cast triumphantly walked through the aisles to enter the scenes and joined in on chants. Thank you to all volunteers and everyone who came out to support the cast! Posted in News, Special Events	| Comments Off on Congratulations Aladdin Cast and Crew! Subaru of America, Inc. today announced support of Lambs Farm, a premier non-profit organization whose mission is helping people with developmental disabilities lead productive, happy lives. The support is part of the Subaru Loves to Care initiative and Subaru funded the development of Lambs Farm’s first-ever sustainable garden, located outside of the organization’s Magnolia Cafe & Bakery, providing a “farm-to-table” experience with the restaurant as well as to provide healthy produce to the participants. In addition to building the sustainable garden, team members from Subaru of America collaborated with the University of Illinois Extension Master Gardeners to install the garden and provide Lambs Farm participants the training needed for its proper maintenance. This training will also provide participants with a new set of skills that they can utilize in the growing garden or take with them to jobs in the surrounding community. Subaru of America, Inc. is a wholly owned subsidiary of Subaru Corporation of Japan. Headquartered at a zero-landfill office in Cherry Hill, N.J., the company markets and distributes Subaru vehicles, parts and accessories through a network of more than 620 retailers across the United States. All Subaru products are manufactured in zero-landfill production plants and Subaru of Indiana Automotive, Inc. is the only U.S. automobile production plant to be designated a backyard wildlife habitat by the National Wildlife Federation. For additional information visit media.subaru.com. Follow us on Facebook, Twitter, and Instagram.